So you’re moving up from picture books, and you’re looking for great stories to read all on your own. Well, those clever people at Random House know just what you need. And they’ve got their very best authors and artists to create it. Exciting stories by major authors: ones that really grab your attention. Bright pictures that help you follow the action. And simple word practice too. The Colour First Reader series gives you all those things. Lucky you! 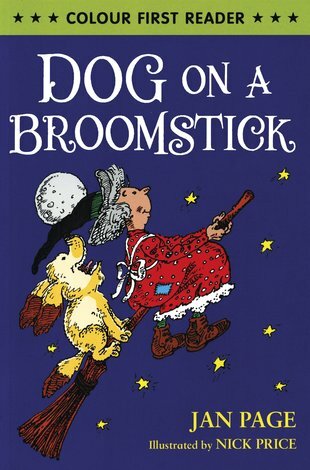 This book was funny because the dog went on a broomstick. It was really funny because the witch forgot her wand for the Spell contest but the dog saved the day. This book was all about a witch looking for a new witches cat because her old cat had a new job. A dog applies for the job. The other witches at the spell contest laughed at the witch because she had a dog not a cat but the dog was very good at magical spells. This book was good as I could read it myself. I think aged 5 plus would enjoy this.